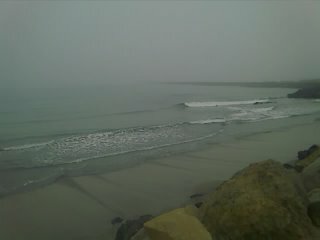 Again the phone camera photo does not do a justice but you can see how glassy the ocean was this morning. Locals say that when the fog is out there is no wind. This is almost always true. When I woke up this morning, there was an indication of the first set of SW swells coming in. I looked at the Jetty and it was glassy but every once in a while some set rolled in, so I decided to get in. As with most S swell sitaution, sets are very few and far in between, but it did crank up every 5 - 10 minutes for about a couple of minutes at a time, and there were some nice curly "Surfrider Foundation Logos" forming in the side of my eyes right while I paddled in for more waves. There must have been other better spots since there was nobody else but me out, but I was really happy because one wave I caught, I was able to get inside a wave a bit! I would not say I was barrelled but I knew that it was coming and plan to steer my board into it, and I courched down really low (well I am always low anyway as you've seen my surfing style).